A yummy pumpkin frozen yogurt for a delicious treat! 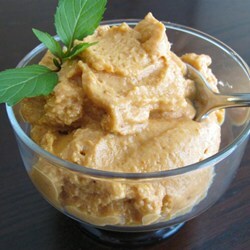 In a large bowl, mix together the pumpkin, yogurt, maple syrup, vanilla extract, cinnamon, nutmeg, and cloves until smooth. Refrigerate the mixture until thoroughly chilled; freeze in an ice cream freezer according to manufacturer’s instructions. Pack the frozen yogurt into a sealed container, and freeze until serving time.